Are You Bribing Your Dog When You Train Him With Treats? You are here: Home / Training / Are You Bribing Your Dog When You Train Him With Treats? Are you bribing your dog, and how can you tell? Well, does your dog ignore you when you leave your treats at home? Has he figured out that when you don’t have cheese, there is no point in coming back to your whistle? This is a very frustrating experience for any dog owner, and one that is often mistakenly assumed by traditional trainers to be the result of training without punishment. Actually, the problem that the dog owner is experiencing has no connection with lack of punishment or discipline. It is all to do with bribery, and the way that bribery influences behavior. If your dog won’t sit unless he knows there is a food reward within the immediate vicinity, then sadly you have not trained your dog to sit at all. What you have been doing is bribing him. Training and bribery are often confused, but they are two very different processes. There are times in the dog training process that we use a temporary “bribe” to establish a new position. This is usually referred to as luring. And it needs to be used in a very specific, and very transient way. We look at this in another article: What is luring? Let’s have a look at what defines training and bribery, and at the differences between them. Training teaches new behaviors. And it teaches dogs to carry out those behaviors under conditions laid down by you. We train dogs to exhibit these new behaviors either as a direct response to a cue or signal that we give the dog, or as a response to a specific situation or context. For example, we may teach a dog to come when we whistle (signal driven behavior) but we can also teach a dog to sit to greet visitors or to go to his bed when we sit down for a meal (context driven behaviors). A trained response is created by reinforcing desirable behaviors or punishing undesirable ones. Or it can be created by a combination of both. Nowadays, modern trainers are moving over to reward-based training both on ethical grounds and because it is very effective and versatile. When we create a trained response, we proof that response so that the dog will carry it out in a wide variety of situations and in the presence of a whole range of different distractions. Bribery is all about inducing the dog to behave in a specific way by offering him some kind of incentive. Something he can see or smell and something that he is attracted to. Food can be an effective bribe for some dogs and in some rare situations. But its uses are seriously limited. A bribe is only effective if it is the most attractive option available. Using a bribe does not establish a response to your signal or cue, at least not the one you want. In a way, what has happened is the the bribe has become the cue, so without it, you have no effective signal to offer. And even if you do have the food bribe with you, in many cases, especially outdoors, there will be better options for a dog, and a bribe has little power under those circumstances. Another drawback of a bribe is that the person trying to control the dog has no means of doing so if the bribe has been left at home on the kitchen table. There is one limited use of a bribe in training, and that is to get a dog into a particular position so that the position can then be reinforced. This is usually referred to as luring. While luring is a useful tool for some skills, it is important to lose the lure very quickly. Often in less than five repetitions. This is because if we persist with the lure, the dog becomes dependent on it, and it effectively becomes a bribe. There are times when it might be appropriate to bribe a dog. If you are trying to help get a frightened, abandoned or injured dog into a crate, for example. If you are trying to divert a large aggressive dog away from a small one, a handful of food thrown towards the large dog might be in order. But bribing is never a good idea in any situation that is likely to recur in the future. For a start, it is very unreliable and depends totally on you having a bribe that is more preferable to the dog than anything else in the vicinity. 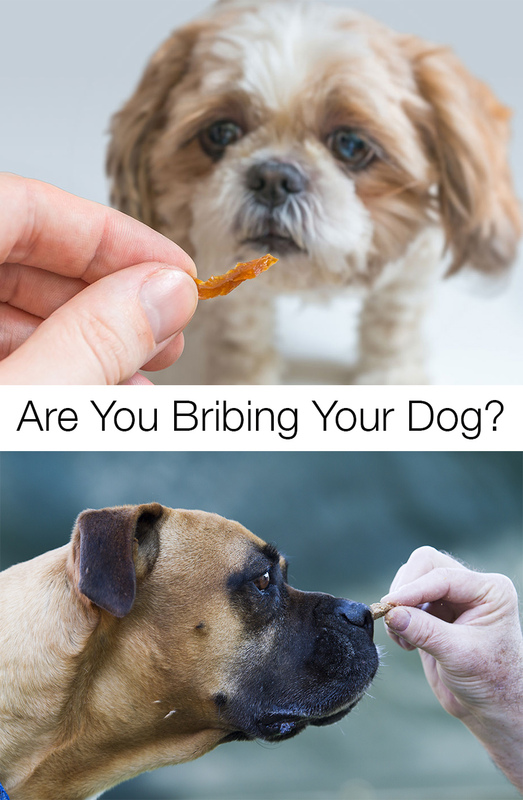 The fact is, bribery is a very poor tool for managing dogs and the use of a food bribe is rarely appropriate in our daily interactions with dogs. So, are you bribing your dog? Remember though, if you keep giving cues without providing reinforcement, your trained response will eventually die. See this article on training extinction. Food is a brilliant dog training tool. Those who think it is not are almost always assuming that the food is being used as a bribe. The proper and effective way to use food in training is to use it to reinforce behaviors that you want to endure. You can teach great behaviors like a snappy sit, a fast recall, a brilliant fetch or some nice loose lead walking with the careful and appropriate use of edible rewards. Many of the exercises on this website use food as a reinforcer. We hope you have fun trying them out! How about you? Did you start out by bribing your dog? Have you learnt how to use food effectively yet?